At West Coast Solar, we support the investment into increasing the longevity and functionality of your solar system. We believe renewable energy is the future for most of the world, and if you can extend the lifespan of your system beyond the 20-30 year mark, it’s an investment well-made. 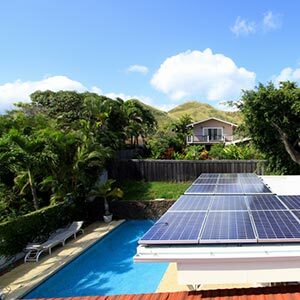 In this post, we’ll discuss the benefits of a solar operation and maintenance package home and business owners may consider after their solar system has been installed. Regular Site Visits: When you invest in an O&M package for your solar system, you will schedule site visits with a provider to ensure the effectiveness and efficiency of your system in general. The provider will also check for any damage since the last visit, report damage, and assist in getting it fixed. Pest and Nest Control: Solar panel systems are easy places for birds and other pests to build their nests. In the case of your system, an O&M package will work to remedy any pest issues that may have surfaced since the last visit. An easy solution to this is a pest guard for your array. It will prevent infestation and nesting. Electrical System Check: During the scheduled site visit, it will include an inspection of your electrical components throughout your solar system. The goal is to ensure the energy you are producing is being done efficiently and transferred properly from the panels to your home or business. Panel Cleaning: Many O&M packages including a cleaning clause, which means whoever visits your site will work to clean the panels. This helps keep your energy production at peak performance without having to risk your own safety to do the cleaning. Repairs and Maintenance: If your solar system gets damaged, an O&M package will include access to professional solar technicians to repair the damage and ensure the proper function of your system once everything is fixed. Inverter Upkeep: Your inverter is what allows for sunlight to become usable energy in your home. If this component is not working correctly, you will either be getting less-than-available energy or no energy at all from your system. An expert will check the inverter and address any issues it may have. 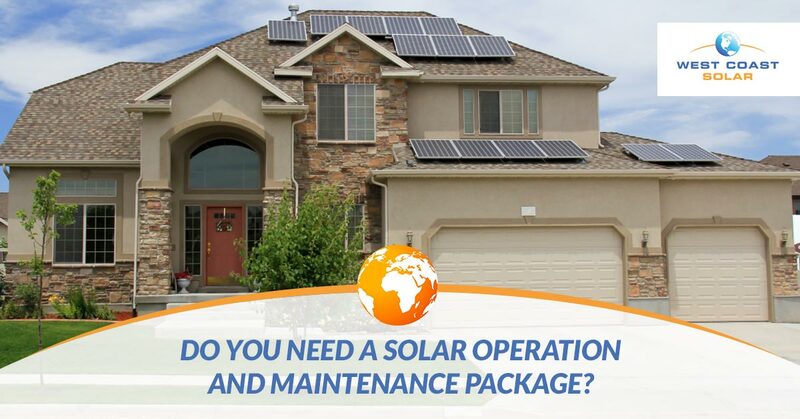 Why Purchase A Solar Maintenance Package? In most cases, a solar installation company offers a labor warranty, which means if your panels get damaged or stop working properly, you can all your installer. However, if your installer does not offer O&M packages, you can call them and ask for a referral before you start your research online. A big reason for purchasing a solar operation and maintenance package is convenience. You won’t have to climb on your roof and repair or clean anything. The purchased package will cover all of this for you. What’s The Difference Between Residential and Commercial O&M Packages? How long have you been maintaining solar systems? Have you worked with my installer before? How much does your O&M package cover? How often will you visit my location for system maintenance? How does damage repair claims work? West Coast Solar has been serving the residential and commercial solar industry for years. Our mission is to keep solar simple and encourage business owners and homeowners to make the switch to solar power sooner than later. There are many incentives and initiative programs to reduce the initial cost of installing a solar system. Over time, you will see a reduction in your utility bill. Are you ready to start designing your new solar system? Give us a call today!